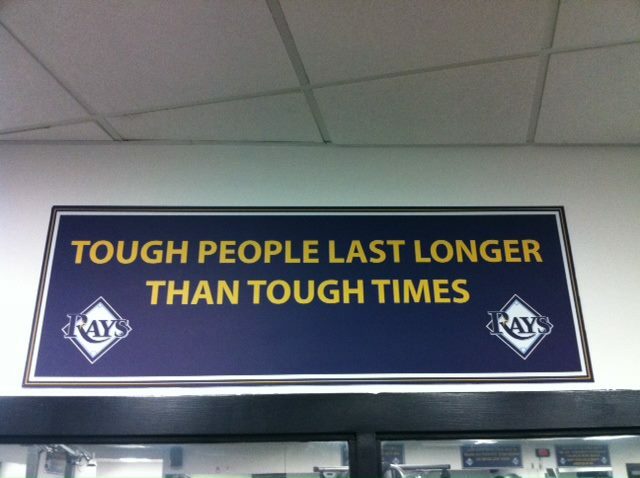 One Word Describes the 2011 Rays…Determined. 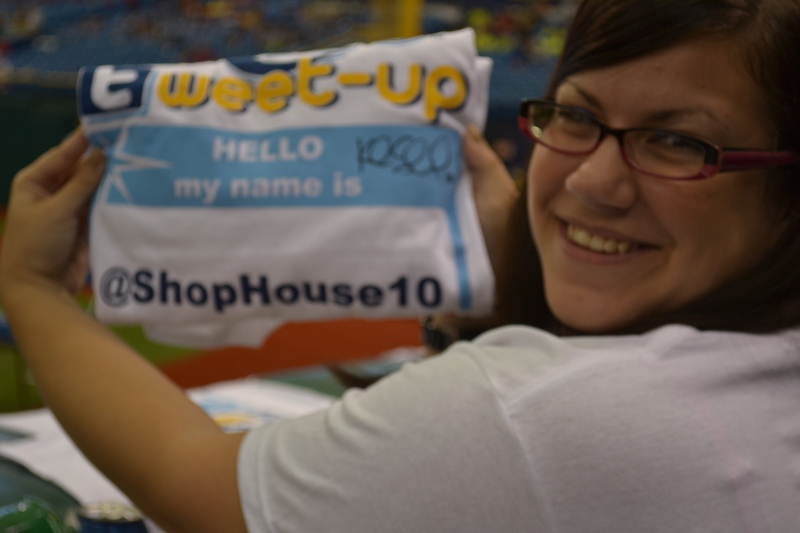 I was sitting somewhere last night and someone asked me one word that would describe the Tampa Bay Rays 2011 season. Instantly the thesaurus and dictionary capillaries went into overdrive. Images and events seems to transcend into my mind, clicks, bells and even a foghorn going off silently in my head until the one word seemed to shine bright…almost angelic to the forefront. That just seemed to fit this young crew of Rays this season. 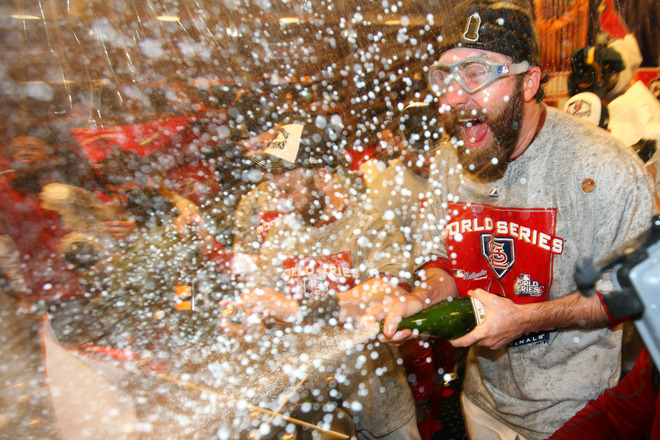 Baseball experts projected them fighting possibly for the third slot in the American League East, but rarely a soul found the courage to pronounce them “Wild Card” darlings. 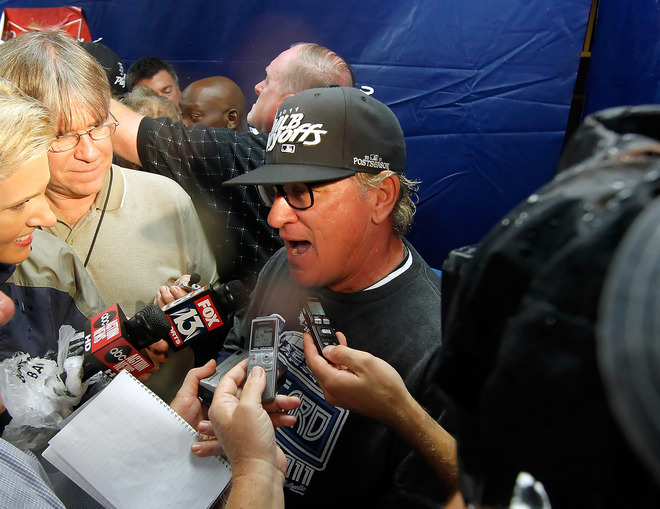 Rays Manager Joe Maddon instilled the mantra “Find Another Way” deep into their collective psyches to show that the road to success this season would be determined by their own want and aspirations. 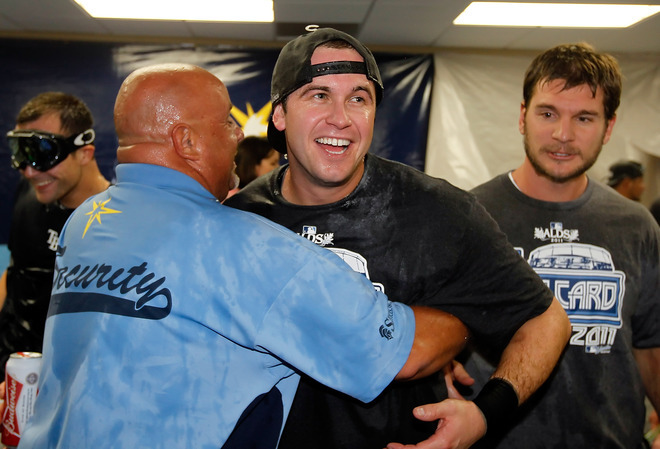 When the Rays announced their 2011 Most Valuable Player during their last home stand, you could have effectively split the trophy into 25 parts for each night it seemed a new hero, a determined athlete who wanted to celebrate not postulate came to the rescue of this Rays squad. 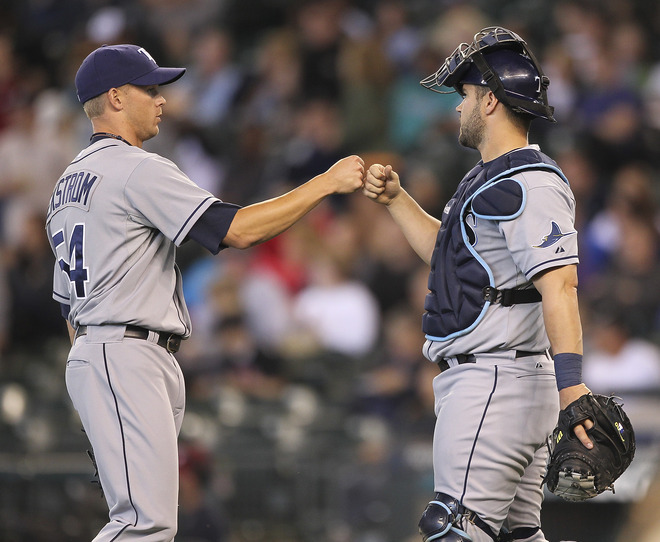 From the Rays starters to the Bullpen, From First Base to the Right field corner this team was a determined unit, with each player having their shares of defining roles in this season. 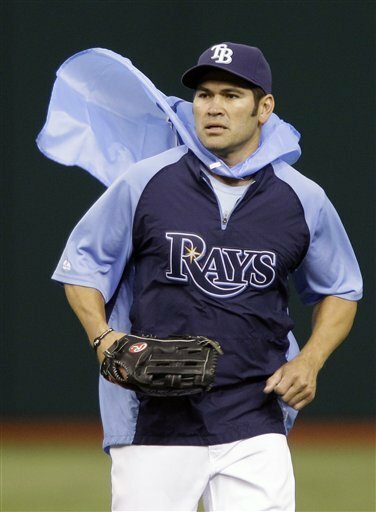 It was simple inspirational to me to see the eternal youth of Johnny Damon steals bases, turn singles into extra base hits, show a excited and zestful leadership that turned the volume up on this team. 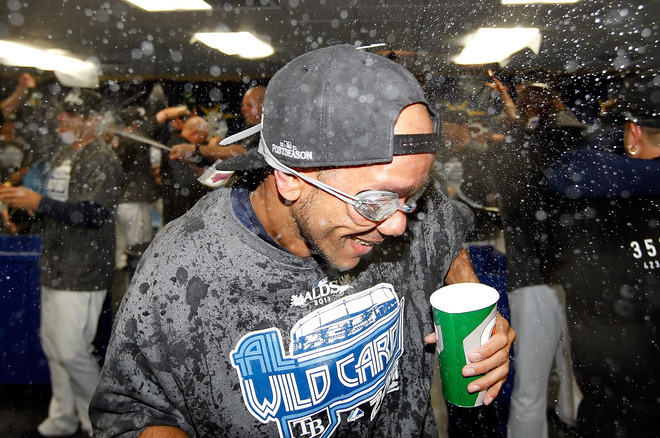 Even guys like Sean Rodriguez, Sam Fuld, Brandon Guyer and Alex Cobb made impressions, showed their potential and raised the bar throughout this season. From veteran to rookie, this team seemed happy and content with passing the cap every night for someone else to lead the way to victory. 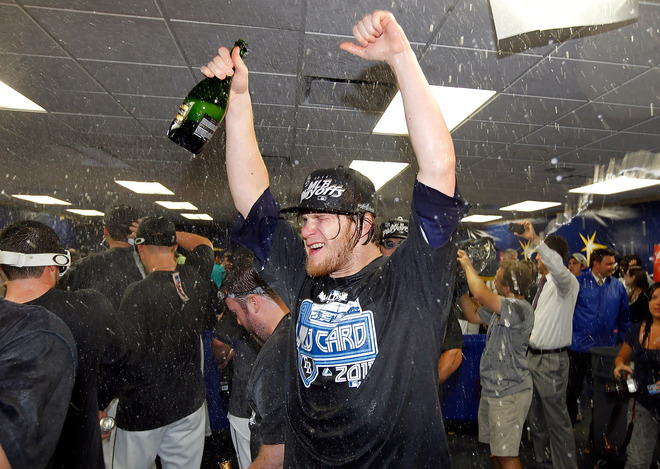 The confidence and the character displayed by the Rays rotation seemed to cement this mentality. They always pitched as if no lead was safe and minimal runs were needed. 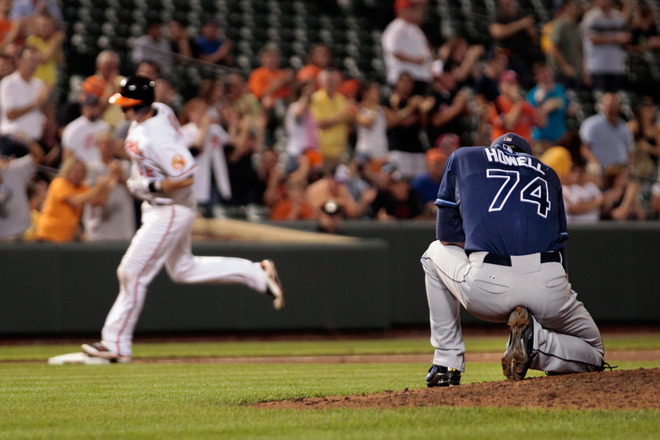 Even when their offense sputtered and shook, the Rays hurlers stepped up their game, produced amazing results and tried to make the bridge between starter and Bullpen one built on success not teeter-tottering towards the abyss. 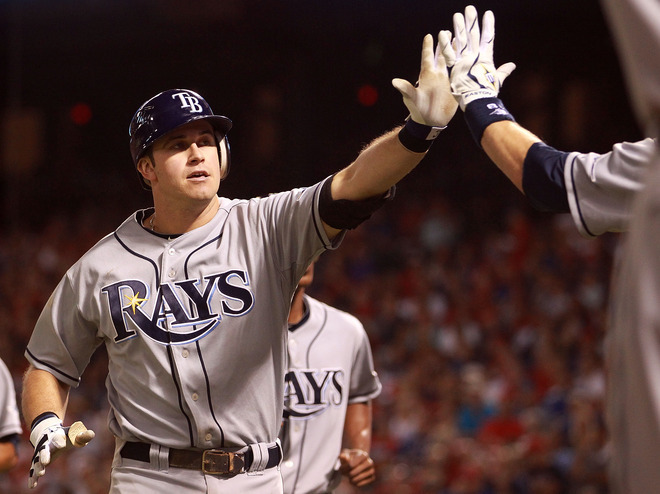 Always determined, the Rays all posted more than 10 wins, and Rays records seemed destined to fall nightly. 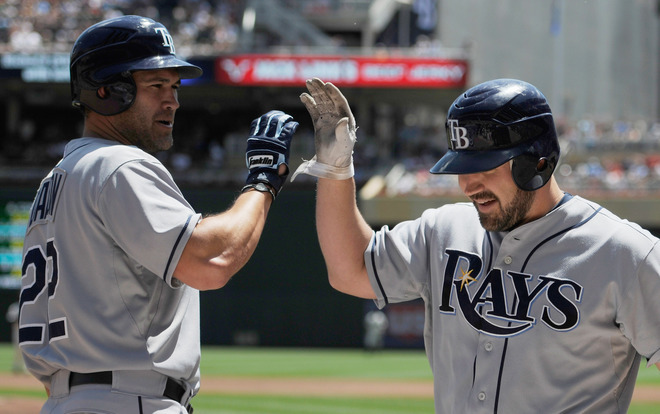 Even with Evan Longoria fighting injury and inconsistency, this team found other ways to produce, induce and collect runs, hits and amazing plays. I always think it shows the true spirit and merits of a team when their key figure has a bad night, or series and the guys around him rally and pull together to produce outstanding results. Sure Longo might have lost a few National followers with his down season, but locally, we saw his heart, his character tested and the end result was a determined athlete wanting to again get to that high level of expectation. 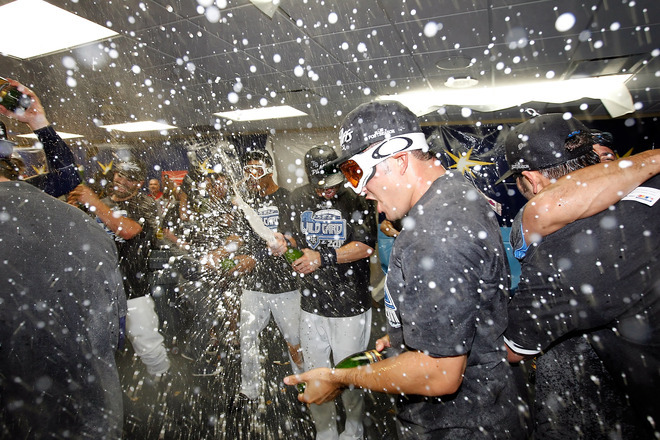 From the All-Star break on, Longoria found his rhythm, found his groove and along with the rest of the Rays, found a way to bypass the expectations and the naysayers to celebrate Mumm’s style. B J Upton has taken a lot of strife and ridicule over the past few years for his base running gaffs and his seemingly lack of hustle, but this season he showed his bat still has the goods, and his defense is up there with anyone in the Major Leagues. When the going got tough, Upton stepped up his game determined to make more than a few broadcasters whisper, make more than a few teams fear his bat, his speed and his skill in the field. He might not have had an All Star season, but Upton did have a season worth remembering. His stats might not glow bright into the night, but his timely strokes and impressive defense kept the Rays in games when most fans around the ballpark thought the Rays would flounder. 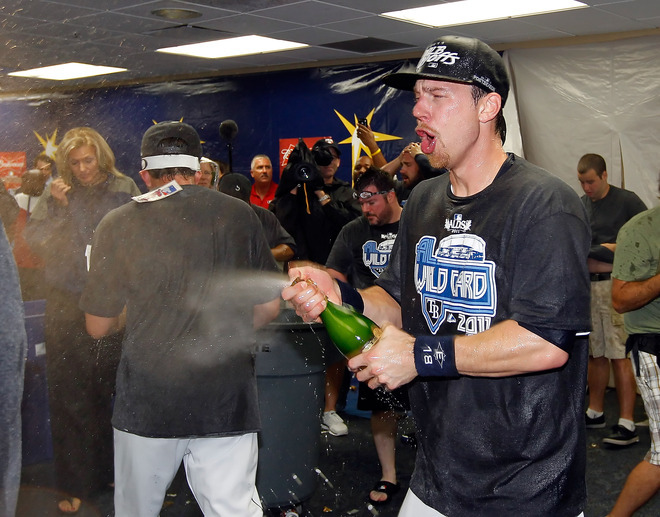 Upton became a clubhouse leader, even if the rest of the stadium didn’t know it. 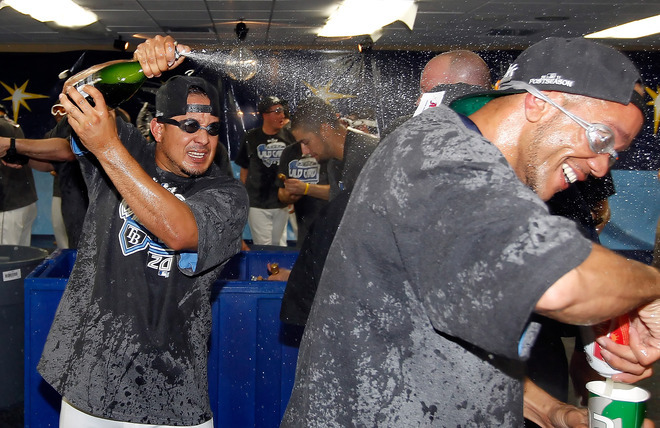 The essence of this 2011 Rays team was based purely on determination. Every game they seemed to be the underdog, and they pulled out magic. On the road they stepped up their game to historical heights, almost seeming like they were possessed on the road while bedeviled at home. When their home record finally reached the .500 mark, they began to watch it also soar as high as their post season aspirations. 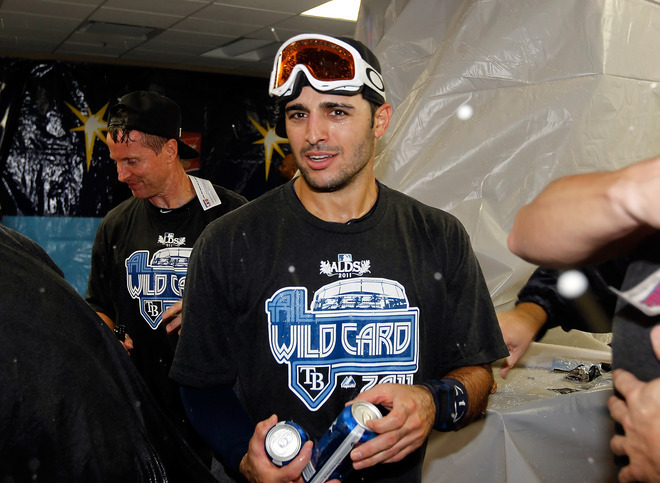 The 2011 edition of the Rays is firmly in the books, their legacy is bound not by their win and loss record, but by the feats and accolades of determination, spirit and never giving in to the temptation of failure. 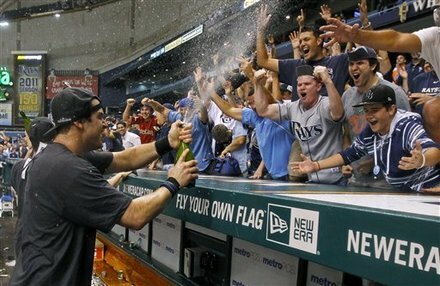 Truly the word “determined” fits this team like a glove from the exploits of Rays catcher Kelly Shoppach to the mystical magic of Matt Moore this Rays squad might have started their own simplistic dynasty built on the sole virtues of eluding defeat, embrace success and showing determination can be the virtue that rewards those willing to sacrifice, strive for the brass ring, and willing to endure. 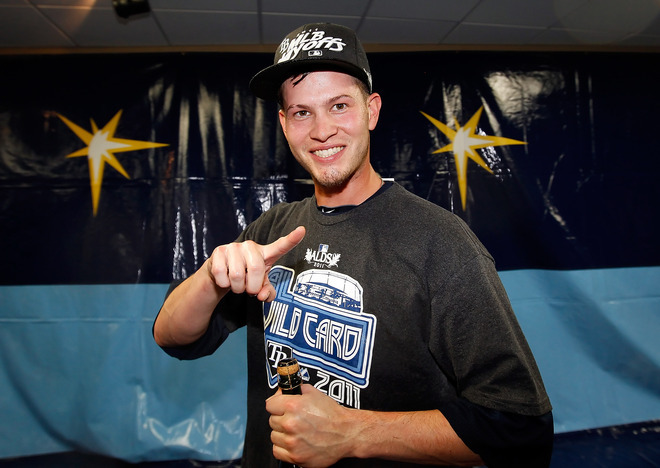 Maybe the 2012 Webster’s Dictionary will include the 2011 Rays Team Photo…..seems only fitting. Do We Need to Worry About Farnsworth? 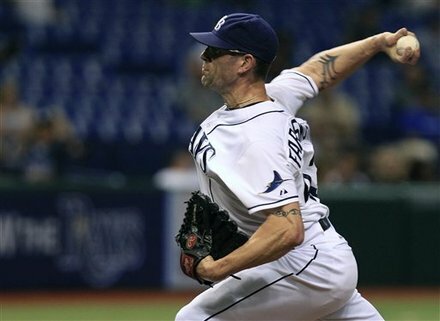 Some have blurted out the notion lately that the Tampa Bay Rays will exercise Kyle Farnsworth’s club option at the end of the season without delay. For some reason, I am smelling a bit of lingering Troy Percival aroma right now on someone’s shoes. 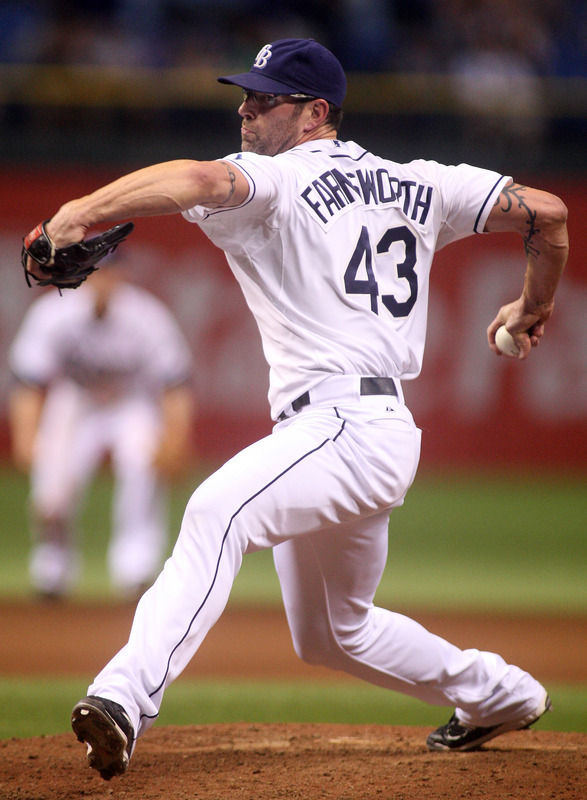 Sure Farnsworth has a really “Rays friendly” $ 3.3 million dollar salary for 2012, but if his elbow flares up and he needs any surgery or down time, it could be a huge kink in the Rays late inning armor. On Saturday night, from the moment Farnsworth got up to begin throwing in the Rays Bullpen, his mannerisms and delivery just seemed a bit off from my seat right behind the Rays Bullpen mound. His pitches before he entered the game in the top of the ninth inning just didn’t seem to have their usual crisp bite to them. His new found friend, the cutter, simply seemed to a bit flat, almost hovering in the zone a little too long. Of course I am not a Pitching Coach, but if I saw a cutter that was not spinning crispy and not starting to dive bomb out of the zone for the corner, I would be wetting my lips that I was about to have a good plate appearance. Sure Farnsworth threw 14 of his 22 pitches for strikes last night, but two of them unfortunately struck spectators gloves in the Rightfield stands. This is not the usual intimidating Farnsworth, this is more like a wounded deceptive Percival. 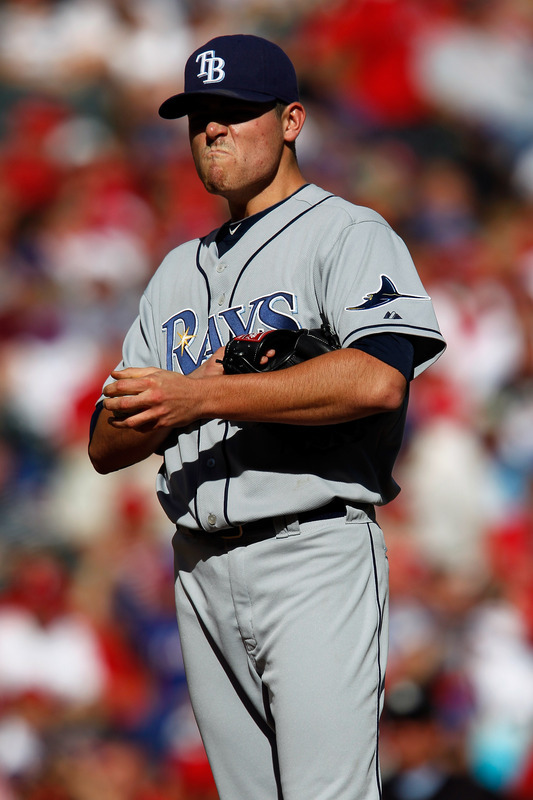 In a span of 6 pitches, the Rays went from leading 5-3 to seeing the Red Sox tie the game 5-all. Farnsworth only productive out of his appearance came courtesy of his first batter Boston SS Marco Scutaro who hit a grounder to Farnsworth, who completed a simple 1-3 put out before the fireworks began. After that first out, Boston’s explosion quickly turned into a possible Rays implosion. And this is not the first time this week the Rays Republic has seen Farnsworth look more unsure of his stuff right now than his usual intimidating himself. I am not trying to insulting Farnsworth right now with the Percival reference, but the way Farnsworth is throwing the ball is eerily reminiscent of the same thing activities that preceded Percival’s two Rays injuries that ultimately turned out to be lingering injuries that Percival was hiding from the team. You only have to go back in time to 4 days ago (September 7th) in a closely contested game against the Texas Rangers to see there is a weird pattern starting to develop within Farnsworth’s late inning success that is beginning to become a bit concerning to me, especially with this Rays squad starting to breathe life back into their post season goal. 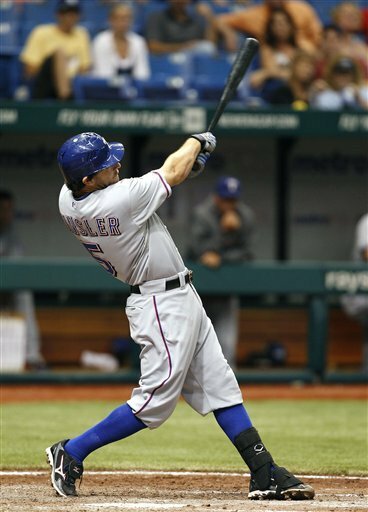 During that September 7th contest, Farnsworth gave aup a monster shot to Rangers INF Ian Kinsler and that homer helped Farnsworth record only his second blown save since a road contest back in Kansas City back on July 23, 2011. Suddenly Farnsworth has materialized into someone less reliable, less dependable than the guy who’s 2.00 ERA was ranked # 1 among American League closers before Saturday night’s 2 Red Sox rocket shots destroyed his chance for save # 24. 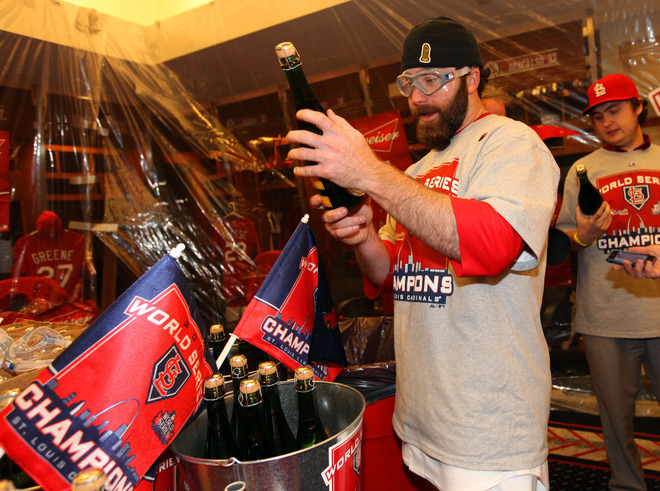 Uncharacteristically Farnsworth as of late has looked more like“Wild Thing” than “Sure Thing”. 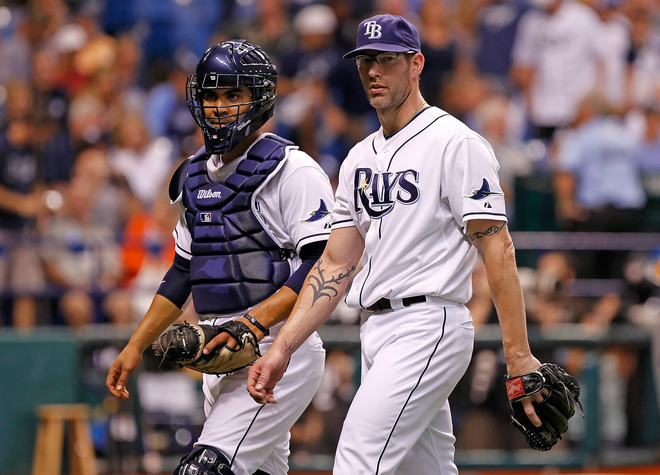 The main conclusion you have to summarize is that Farnsworth might not be completely healed, or might be shunning off the intense pain factor in his right elbow to instead try and be a veteran presence and defensive stalwart because of the Rays fragile situation in the Bullpen. Farnsworth might be hiding a simple truth. He is hurt, but does not want to be a cause or reason for the Rays stumble even for a simple hiccup in their playoff chase. But “taking one for the team” is a noble and respectful thing usually within baseball, but not a great attribute when you are counted on and you do not have your stuff at the A+ level Farnsworth possessed before his recent “late season vacation” due to elbow soreness. Considering Farnsworth has surrendered 1 Home Run allowed for every 63 batters faced (10-HR, 633-BF) since 2009, this latest plunge into the darkness has merit for Rays Republic worry. Hopefully it is just another fluke blown save appearance, one that is now out of Farnsworth’s system, but the recent home blown save string has to begin to worry more than Farnsworth, it has to worry Rays Manager Joe Maddon and the Rays Republic. If Farnsworth were to go down with an injury at this juncture in the post season run, it could cripple a vital cog in the Rays late inning machine. I’m not trying to say the Rays need to investigate for themselves, do medical tests on Farnsworth’s elbow, maybe it is just simply time for the Rays to let someone else take the 9th inning reins for a few games. Let Farnsworth get himself has his glorious out pitch, the cutter, back into that defined groove that moves us so well after Rays victories. 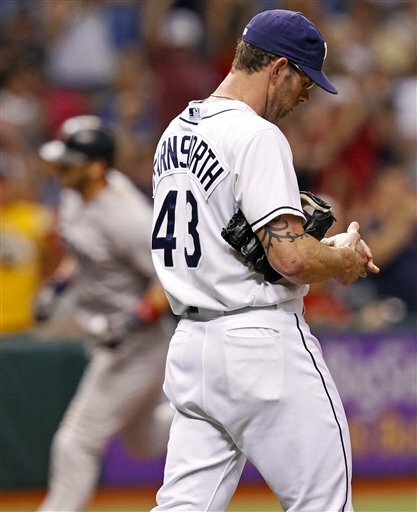 I hope it is just simple fatigue or that his pitches right now are just missing their marks, but the only one who knows the truth is Farnsworth and Rays catcher Kelly Shoppach who came on in the 9th to go behind the plate. I have a feeling neither of them will be speaking about it anytime soon. But we need full disclosure right now, hurt or not, something is just not in sync right now with Farnsworth, and it needs to be fixed fast, or catching Boston will be the least of the Rays worries. Not sure why, but this abbreviated 2-game series against the New York Yankees felt so bitterly anti-climatic. Made the fact that neither the Tampa Bay Rays or the visiting pinstripes can thrust their chests out as the absolute “ winners” or “losers” of this peculiar series. 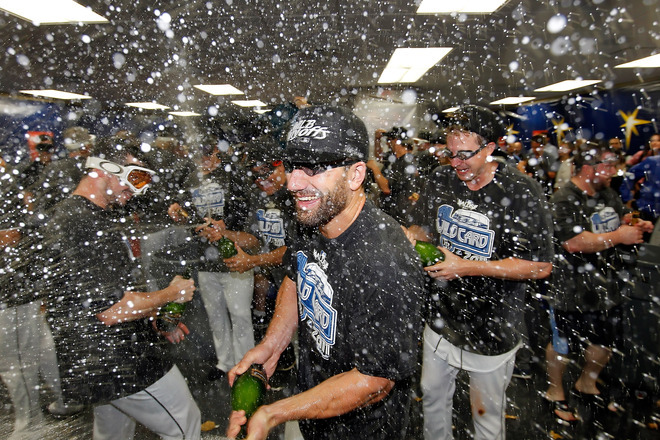 Maybe the pure fact that each squad left the Tropicana Field AstroTurf on Tuesday night sporting identical 1-1 seasonal records took some of the emotional victory out of it all. 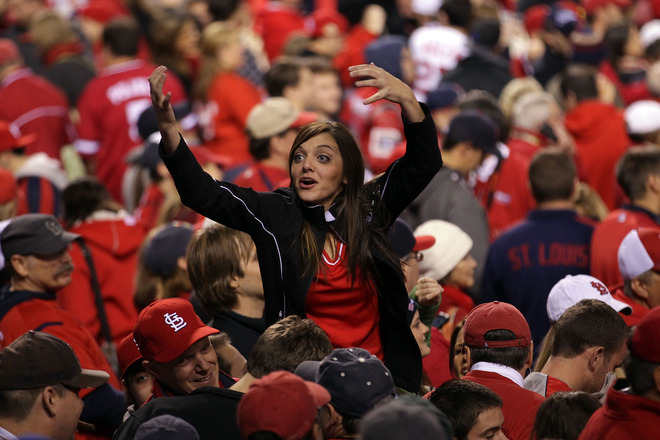 We are going to have to get used to it this week as 2-games series will dot the Major League Baseball landscape as a way to get the MLB schedule in line for the fast approaching InterLeague showdowns starting this weekend. It really felt odd during this series to not have that third game to push a bit of supremacy to one team for at least a little while. With only 2 contests in this series, it was hard to focus or even divulge which team might have an advantage in the final 16 games between these two increasingly bitter rivals. Each of these contests showed a display of polar opposite styles of play with one teams just seeming to not be quite in tune, or just a step behind. With the Rays playing under the .500 level at home this season ( 11-13), this series really had me worried since the Rays had not scored more than 5 runs in their last 22 home games. Suddenly in the 6th inning, the Rays finally found their missing cask of mojo and quickly posted 5 runs on the board in front of the home crowd. Oddly enough, the offensive outburst came after Rays Ace David Price was out of the ballgame and did not fact into the decision. 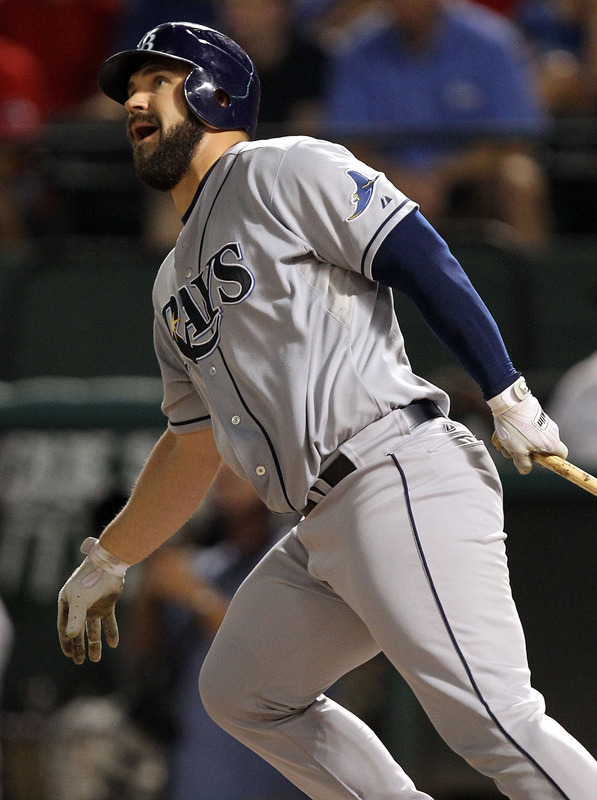 Their energetic explosion included 3 Home Runs and helped paced the Rays to their 24th victory of the season. 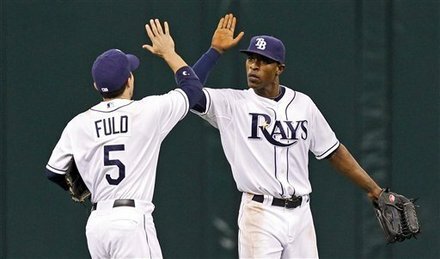 The opening series win got the Rays on the threshold of possibly finally secure a .500 mark at home this season. The Yankees came into this series with a bit of drama within their ranks, but possibly the loss to the Rays on Monday night pulled them together enough to put out a great effort on Tuesday night to supplant the Rays dreams of hitting that home .500 mark. These 2 games were as different as night and day for each squad as they took turns taking advantage of each other’s minor mistakes, missed pitch locations and each dug the knife in deep to provide enough momentum to secure a win. 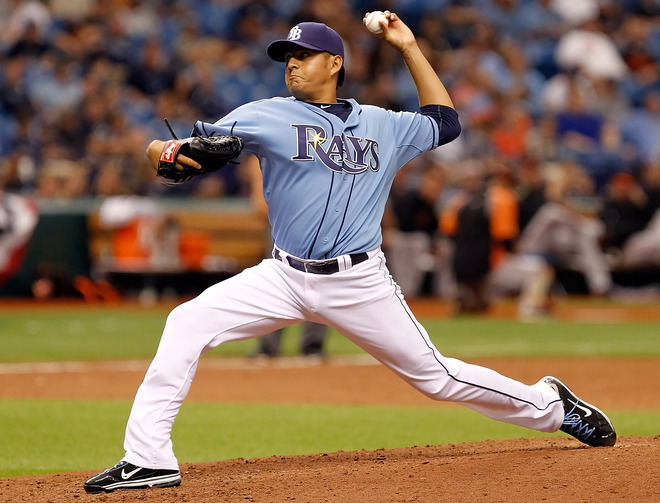 The Tuesday contest started to show some signs of being a great pitching display match-up between Rays veteran James Shields and Yankee youngster Ivan Nova. Each pitcher made a few early mistakes and saw solo shots by Rays INF Elliot Johnson and Alex Rodriguez exit the ballpark into the grandstands before the Yankee began to fluster Shields to produce a second error to Rodriguez, plus spot the Yankees to a 4-1 lead. Somehow the Rays did not have the guns to provide a second night of lighting up the Trop’s roof orange and could only muster another run thanks to a Ground Rule double down the Rightfield line by Ben Zobrist in the bottom of the 9th. 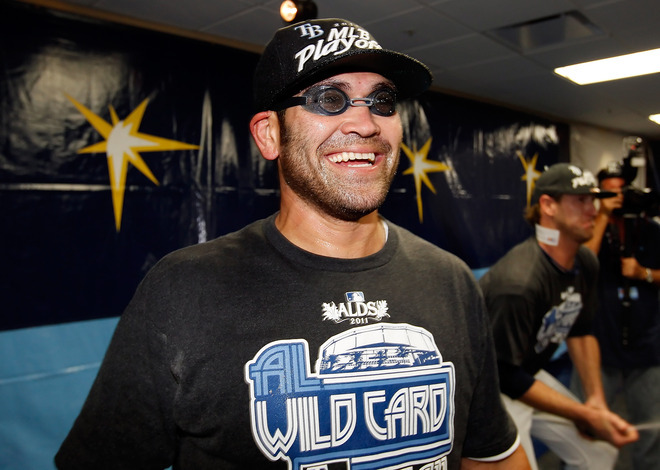 6-2 was as close as the Rays would get as Mariano Rivera came on to get former teammate Johnny Damon to ground out to first for the Yankees 21st win and gain a game on the Rays. But the night was not without drama. Well, at least on the Rays side of the coin. 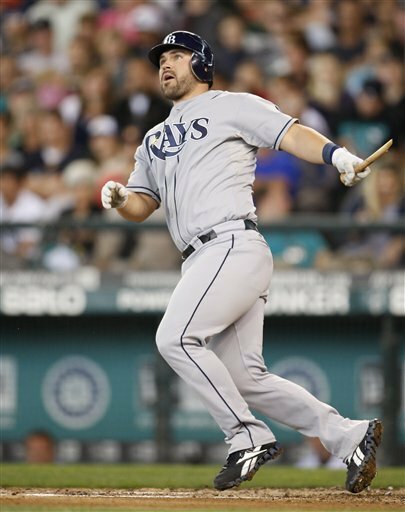 In that last inning, Rays catcher Kelly Shoppach hit a high fly ball deep into the stratosphere of the Trop that seemed to bounce off one of the infamous catwalks. In every video replay you can see without a doubt the path of Yankees Leftfielder Brett Gardner was alter and diverted by the “ping-pong” action of the ball as it careened off one of the overhanging steel structures. Gardner did somehow position himself under the ball even with a last moment change in his body direction to bring the ball into his glove. Initially it looked like the ball had hit the C-ring, which would award a solo Home Run to Shoppach. Rays Manager Joe Maddon urged Home Plate Umpire Gary Darling and the rest of the crew to convene and discuss the play for a possible review. 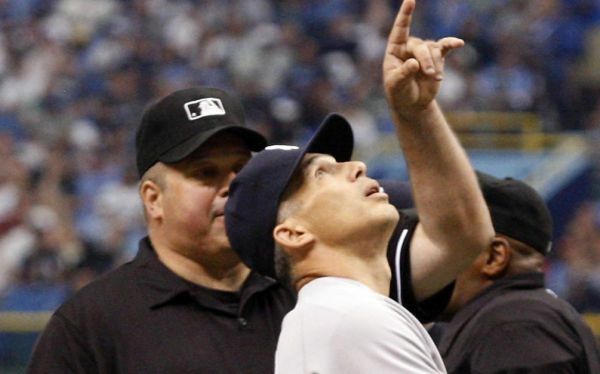 The Umpire crew made the right decision to review the play as it was not clear by television replays whether the ball bounced off the B-ring, or the C-ring. 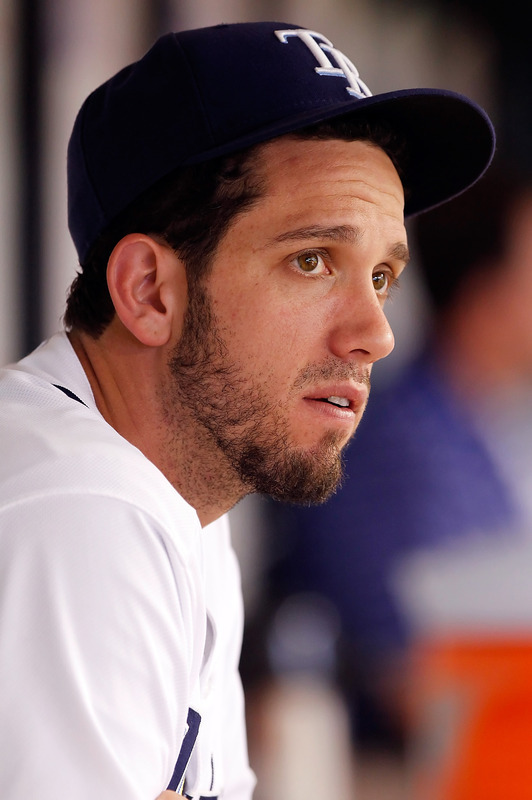 One would produce a Rays run, the other the second out of the inning. In the end, the Umpires got it right as post game video showed the ball struck the B-ring on its lowest point before heading towards the C-ring. 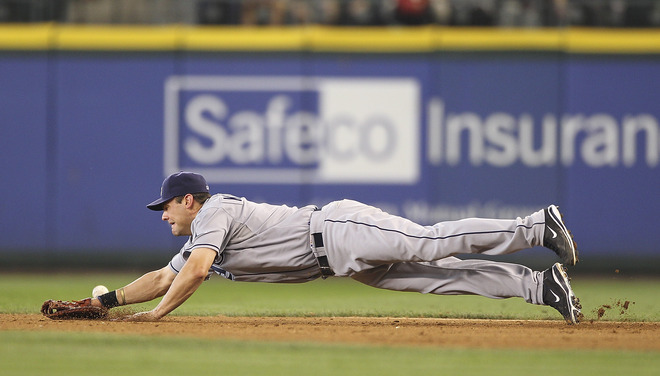 That made it a catchable ball resulting in the inning’s second out. This contest really wasn’t that close, but the Rays have a habit of last inning heroics, and at that moment Rivera was not in the ballgame. When you play a divisional rival, you love that third game so you can vocally display your pride. This 2 game series basically added a single win to each team’s record, provided some interesting fodder for the future contests, and above all showed that these 2 squads are closer in abilities than their payrolls suggest. Sure I would have loved a second win on Tuesday night to provide a statement by sweeping the Bronx Bombers, plus the addition of finally getting back to a .500 record at home. With the Rays heading out on a 8 game road trip, which includes a 2-game series in Toronto, plus 3-games series each against the Tiger and Marlins before the Rays hit the comfort of home Turf again. By ending up the series at 1-1, it did not give either team an advantage in the American League East division except take one win away from each other. This series did not have the usual pomp and circumstance of a Yankees stroll into the Trop, possibly having a bit of the internal drama within the Yankees organization stealing some of the thunder of the match-up. These two high powered squads will not mix it up again until a 4-game series (July 7-10) in the Bronx as the last series each team will have before the All Star break. In the end this abbreviated series got each team’s feet wet in their 18-game seasonal series. Back when I played sports, the Internet was still in the early infant stages and wireless devices consisted of maybe a walkman or a portable transistor radio. The advent of WiFi technologies and World wide gaming communities had even came into anyone’s mind yet. Mostly we just played a variety of cards games like Poker or Hearts to bid the time before suiting up for warm-ups or during our transport to and from our charter flights. Laptop were not even in the future thought process yet, and the Apple I Pod and I Pad were possibly just dreams or faint ideas still in computer technology think tanks. With the advancements of the wireless and computing technologies all around us today, the Internet and games of chance with a side order of obsession are just a small mouse click away. I have a few friends who have plunged deep into the online farming community on Facebook known as “Farmville“, but as of now, I am still virginal and not partaking in that ritual farming industrial community. 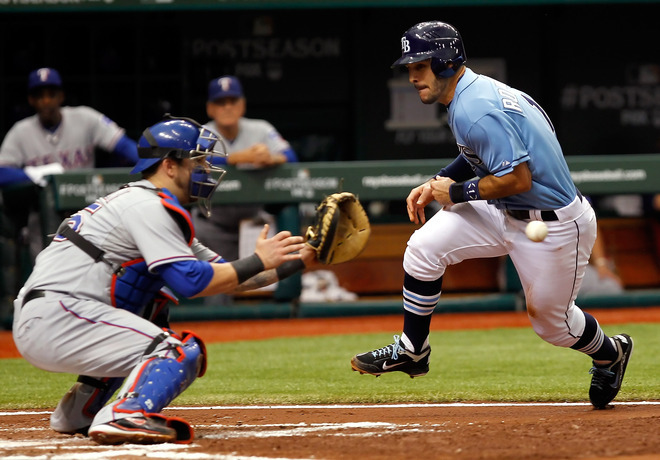 It is intriguing and a bit understandable that the players within the Tampa Bay Rays might have caught onto the growing fever of these downloadable games where compulsive endurance and chance both seem to rule the process. These games seem just perfectly suited for a bunch of baseball players due to the odd facts that during a 162 game Major League Baseball season, there is a huge amount of “down” time usually spent away from home, waiting for something to happen (pre-game, rain delays) that could entice a person to become entranced into developing and cultivating an online community of their own. 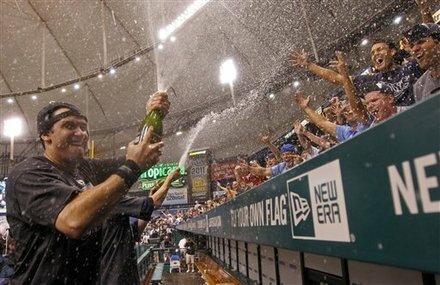 During the 2010 MLB season, I have heard many whispers about an ever growing obsession within the Tampa Bay Rays clubhouse of several downloadable games and obsessive-compulsive programming that acted as buffers to the game pressures and simultaneously garnered internal competitions between the players. 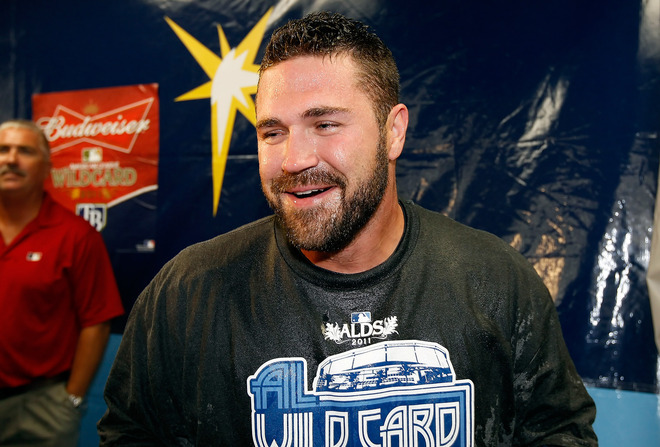 This rumor encircling the Rays clubhouse did not have to do with any World Poker Tour card playing websites, or even Fantasy leagues. Somehow the Rays clubhouse, who all seem to have embraced their WiFi friendly Apple I Pads, has developed a budding cultivation within the online farming communities in the “We Farm” game. A game that is FREE to download from I Tunes or Apple, but can be as addictive as a large cup of caffeine if you give it a chance. Several members of the Rays clubhouse have become a bit addicted and currently spend countless hours tending to their crops or designing the perfect scenario to be awarded a possible Blue Ribbon animal or get picked as the “Farm of the Week”. Most of us who do not cruise an Apple based I Pad system might not have even heard about this downloadable game for I Pads and Apple WiFi devices. This farming community gives game players the tools to make the barnyards of their dreams. Farmers who range from city slickers to real life rural country boys, have taken to this addictive game. 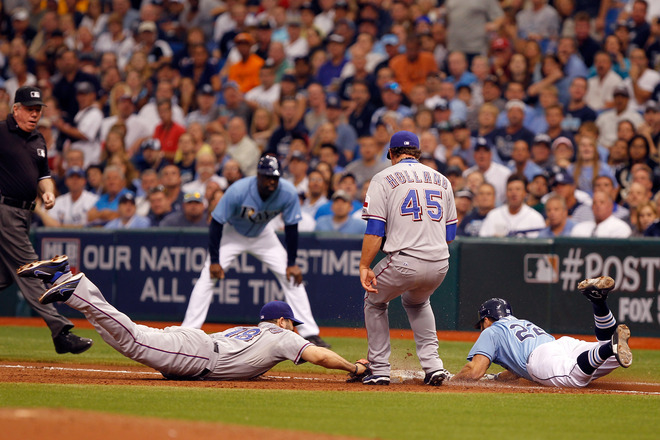 As the 2010 progressed, more and more of the Rays roster have been engulfed by this addictive competitive game. Maybe it is purely the fact that they can be a simulated Roy Oswalt and outfit their personal farms with tractors, hay balers, sprayers and even build produce stands to sell their farming products just beyond their own fields. Maybe it is the majesty of knowing you can surrounding your property with multi-hued outhouses or the great non financial aspect of breeding and raising your own digitally rendered faux horses, pigs, sheep, cows, duck and even ostriches within a online community that has peaked their brainstems. Maybe it is something as simple as a PG-13 rendition of an activity that everyone, including involving their children into helping on the farming projects that can be developed mutually as a entire family inspired working farm. 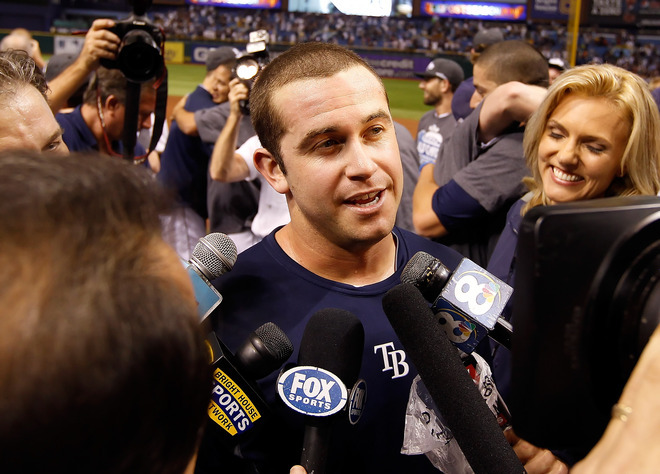 The game seemed to have introduced into the Rays clubhouse by Rays starting pitcher James Shields, who used to help tend and tailor his young daughter Ashtyn on her own “We Farm” spread on off days and during a Rays home series. Quickly the competitive fires rushed through the Rays locker room as David Price, B J Upton, Matt Garza, Kelly Shoppach, Matt Joyce, and Shields were suddenly going head-to-head on their own farming communities, trying to be the best in the Rays small kingdom. When late season addition Chad Qualls came to the Rays via a trade with the Arizona Diamondbacks, Qualls soon fell quickly into the Rays farming community battles. There is even a section of the game where you can have your friends and neighbors take pictures with you and your prize winning animals at the county fair. I wonder if Price has done that feat yet? This farming community game has become such a web hit that the currently have their own Youtube Channel, and their own social media outposts to keep you updated and in tune with the whole sha-bang of new additions and words from game players all around the globe. Even heard a wild rumor of some “We Farm” trash talking and farm challenges being issued by the Rays farmhands. Maybe if the Rays finish off the Rangers tomorrow in that Game 5 finale, for their next road trip (possibly to New York City for Games 3-5 of the ALCS) the Rays could all dress in blue overalls and straw farmers’ hats as a team homage to the “We Farm” gaming site. .
Heck they would be heading to the big city, the Big Apple, why not dress accordingly with their new found obsession. Think “Green Acres” or “Petticoat Junction” if you need any motivation here. There are still plenty outside the city limits of “We Farm“-ville who do not understand the total intrigue and pull of the competitive game…..yet. But you can bet that those already playing in the community within the Rays clubhouse will take their time converting more than a few other Rays roster members as they pick them off one-by-one and get them interested in the great off season treat of playing this game as a possible team bonding unit for 2011. Could also be a great way to indirectly see how teammates and friends are doing in the off season as everyone goes their separate ways until mid-February. 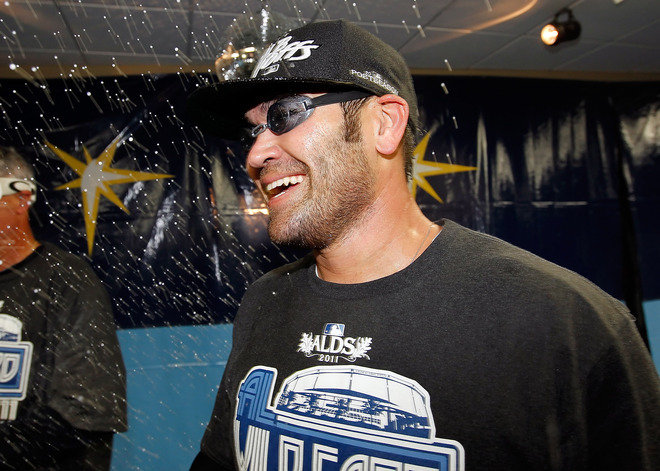 Wonder how many of the Rays players have unlocked the Diner at Level 23 that come complete with a surly waitress? Or the possibility of owning your own Drive-In that appears on Level 33. What a treat it would be to pull your pick-up backwards into the parking spot and watch the movies from the comfort of an old chair in the bed of your truck. Wonder if any of the Rays players have currently unlocked the farmhouse upgrade in Level 35 of the Outland Chateau? These games can be great stress relievers and a great way to get your mind off the pressures and bottling emotions that can be constantly churning in your mind and stomach this time of the year. They can be hotel and airplane lag time deviations that can give you an outside visual or a faraway place to recharge, reconnect or just restock your chicken coop. With the level of intensity all ready churning in the Rays clubhouse over “We Farm“, it will be amazing to see the level numbers and the upgrade or “Gro” options that the Rays involved players will have selected and presented to their colleagues come this Spring. It is a harmless and victimless game of competition that has no victims, no weapons or gore unlike some other obsessive online simulation games. It is a great way to kill a few hours in-flight, during a rain delay, or possibly just before heading out onto the field for Batting Practice. Leave it to Shields to be the one character with tunnel vision in the Rays clubhouse that doesn’t let his every day actual job slip too far from his mind while playing online. In Shields perfection on his farm he has constructed a baseball diamond within a surrounding mesh of blueberry bushes. Maybe there isn’t a corn option yet on Shield’s levels, but if there was, it would truly be his own personal slice of a Field of Dreams…Tampa Bay style.